Until barely two weeks ago, Pluto tantalized humanity for eight decades with mysteries we could only imagine – seen as just a point of light or fuzzy blob in the world’s most powerful telescopes. Now the last explored planetary system in our solar system is being revealed for the first time in history to human eyes, piece by piece, in the form of the highest resolution flyover mosaics and movies of the alien surface ever available, now and for decades to come. And it’s all thanks to the brilliant efforts of the scientists and engineers leading NASA’s New Horizons mission – which culminated in the first ever close encounter with Pluto and its five moons by a spacecraft from Earth on July 14, 2015. With the resoundingly successful close flyby completed and the piano shaped New Horizons probe now looking in the rear view mirror, the scientific booty is raining down on receivers back on Earth. However it will take about 16 months to send all the flyby science data back to Earth due to limited bandwidth. The first series of seven breathtaking high resolution surface images focusing on Pluto’s bright heart-shaped region, informally named ‘Tombaugh Regio’, has been stitched together into our new and wider view mosaic, shown above and below, by the image processing team of Marco Di Lorenzo and Ken Kremer. 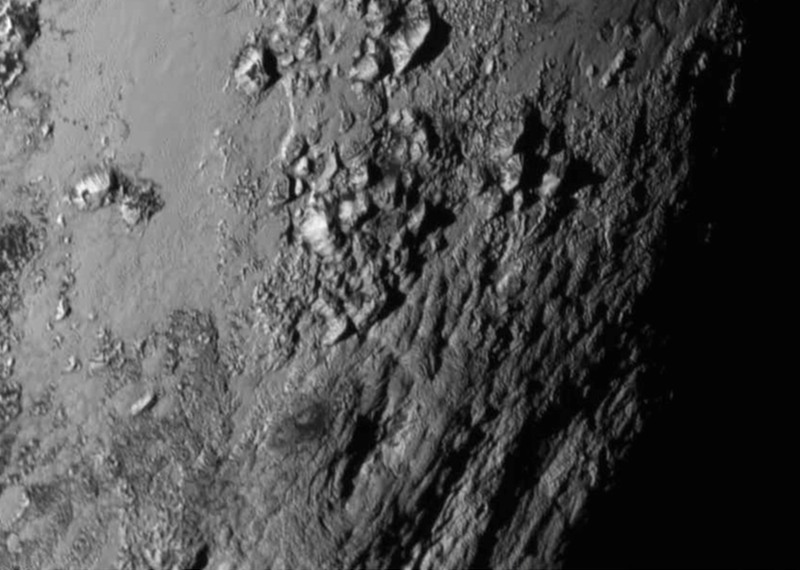 The mosaic and movie are compiled from the seven highest resolution images captured by NASA’s New Horizons LORRI imager during the history making closest approach flyby. The newly-discovered mountain range has been informally named Hillary Montes (Hillary Mountains) for Sir Edmund Hillary, who first summited Mount Everest with Tenzing Norgay in 1953. They rise about one mile (1.6 kilometers) above the surrounding plains, similar to the height of the Appalachian Mountains in the United States. They are located nearby and somewhat north of another mountain range discovered first and named Norgay Montes (Norgay Mountains). 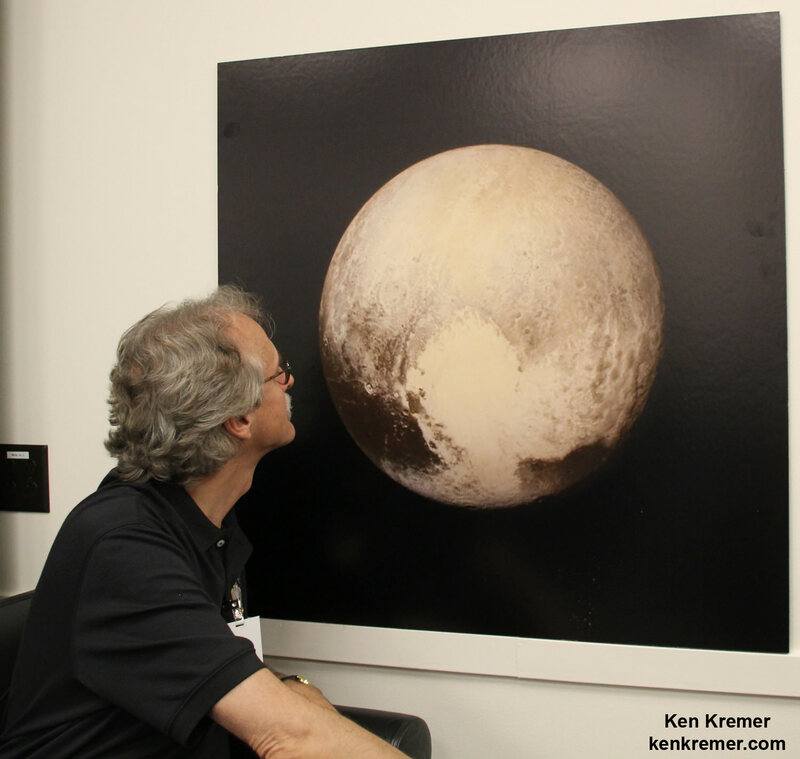 “For many years, we referred to Pluto as the Everest of planetary exploration,” said New Horizons Principal Investigator Alan Stern of the Southwest Research Institute, Boulder, Colorado. Sputnik Planum is a Texas-sized plain, which lies on the western, left half of Pluto’s bilobed and bright heart-shaped feature, known as Tombaugh Regio. The new imagery and spectral evidence from the Ralph instrument appears to show the flow of nitrogen ices in geologically recent times across a vast region. They appear to flow similar to glaciers on Earth. There are also carbon monoxide and methane ices mixed in with the water ices. “At Pluto’s temperatures of minus-390 degrees Fahrenheit, these ices can flow like a glacier,” said Bill McKinnon, deputy leader of the New Horizons Geology, Geophysics and Imaging team at Washington University in St. Louis. As of today, July 26, New Horizons is 12 days past the Pluto flyby and already over 15 million kilometers beyond Pluto and continuing its journey into the Kuiper Belt, the third realm of worlds in our solar system. The science team plans to target New Horizons to fly by another smaller Kuiper Belt Object (KBO) as soon as 2018. Spectacular imagery of huge regions of flowing ice, monumental mountain ranges and a breathtakingly backlit atmospheric haze showing Pluto as we’ve never seen it before, were among the newest discoveries announced today, July 24, by scientists leading NASA’s New Horizons mission which sped past the planet for humanity’s first ever up-close encounter only last week. New Horizon’s revealed Pluto be an unexpectedly vibrant “icy world of wonders” as it barreled by the Pluto-Charon double planet system last Tuesday, July 14, at over 31,000 mph (49,600 kph). The scientists publicly released a series of stunning new images and science discoveries at Pluto that exceeded all pre-flyby expectations. “The images of Pluto are spectacular,” said John Grunsfeld, NASA’s associate administrator for the Science Mission Directorate, at today’s media briefing. Over 50 gigabits of data were collected during the encounter and flyby periods of the highest scientific activity in the most critical hours before and after the spacecrafts closest approach to Pluto, its largest moon Charon and its quartet of smaller moons. Data from the flyby is now raining back to Earth, but slowly due to limited bandwidth of an average “downlink” of only about 2 kilobits per second via its two transmitters. “So far we’ve seen only about 5% of the encounter data,” said Jim Green, director of Planetary Science at NASA Headquarters in Washington. At that pace it will take about 16 months to send all the flyby science data back to Earth. Among the top highlights is the first view ever taken from the back side of Pluto, a backlit view that humans have never seen before. It shows a global portrait of the planets extended atmosphere and was captured when NASA’s New Horizons spacecraft was about 1.25 million miles (2 million kilometers) from Pluto. It shows structures as small as 12 miles across. “The silhouette of Pluto taken after the flyby and show a remarkable haze of light representing the hazy worlds extended atmosphere,” Alan Stern, principal investigator for New Horizons at the Southwest Research Institute (SwRI) in Boulder, Colorado, said at the media briefing. “It’s the first image of Pluto’s atmosphere!” said Michael Summers, New Horizons co-investigator at George Mason University in Fairfax, Virginia, at the briefing. The image was taken by New Horizons’ high resolution Long Range Reconnaissance Imager (LORRI) while looking back at Pluto, barely seven hours after closest approach at 7:49 a.m. EDT on July 14, and gives significant clues about the atmosphere’s dynamics and interaction with the surface. It captures sunlight streaming through the atmosphere. Methane (CH4) in the upper atmosphere break down by interaction of UV radiation and forms ethylene and acetylene which leads to more complex hydrocarbons known as tholins – which the team says is responsible for Pluto’s remarkable reddish hue. The images focuses on Sputnik Planum, a Texas-sized plain, which lies on the western, left half of Pluto’s bilobed and bright heart-shaped feature, known as Tombaugh Regio. New imagery and spectral evidence from the Ralph instrument was presented that appears to show the flow of nitrogen ices in geologically recent times across a vast region. They appear to flow similar to glaciers on Earth. There are also carbon monoxide and methane ices mixed in with the water ices. A vast, hundreds of miles wide craterless plain of Plutonian ice no more than 100 million years old and centered amidst Pluto’s big ‘heart’ was unveiled in spectacular new imagery taken by NASA’s resounding successful New Horizons mission, during its history making rapid transit through the Pluto-Charon binary planet system barely three days ago, on Tuesday, July 14. The jaw dropping new imagery of young plains of water ice was publicly released today, July 17, by NASA and scientists leading the New Horizons mission during a media briefing, and has already resulted in ground breaking new scientific discoveries at the last planet in our solar system to be visited by a spacecraft from Earth. 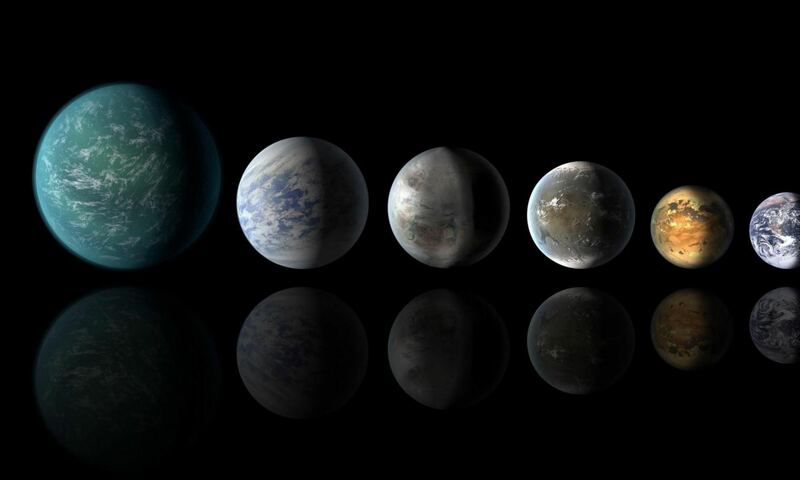 New data and dazzling imagery are now from streaming back some 3 billion miles across interplanetary space to mission control on Earth and researchers eagerly awaiting the fruits of more than two decades of hard labor to get to this once-in-a-lifetime opportunity. “I can’t wait for the new discoveries!” exclaimed Bolden at today’s media briefing. “Over 50 gigabits of data were collected during the encounter and flyby periods,” New Horizons principal investigator Alan Stern of the Southwest Research Institute, Boulder, Colorado, said during the media briefing. It will take some 16 months for all the Pluto flyby data to be transmitted back to Earth. Two new high resolution images captured by the probes Long Range Reconnaissance Imager (LORRI) on July 14 were released today and taken from a distance of 48,000 miles (77,000 kilometers). Features as small as one-half mile (1 kilometer) across are visible in the images – shown above and below. They were snapped from frozen region lying north of Pluto’s icy mountains, in the center-left of the heart feature, informally named “Tombaugh Regio” (Tombaugh Region) after Clyde Tombaugh, who discovered Pluto in 1930. Notably, some of the clumps are filled with mysterious darker material. Hills are also visible in some areas, which may have been pushed up. Etched areas on the surface may have been formed by sublimation process where the water ice turns directly from the solid to the gas phase due to the extremely negligible atmosphere pressure. In some places there are also streaks that may have formed from windblown processes and pitted areas. “It’s just pure coincidence that we got the highest resolution data at Sputnik Planum which is of the most interest scientifically,” Moore noted. Moore indicated that the team is working on a pair of theories as to how these polygonal segments were formed. “The irregular shapes may be the result of the contraction of surface materials, similar to what happens when mud dries. Alternatively, they may be a product of convection, similar to wax rising in a lava lamp. On Pluto, convection would occur within a surface layer of frozen carbon monoxide, methane and nitrogen, driven by the scant warmth of Pluto’s interior,” Moore explained. Pluto’s polygons look remarkably similar to the Martian polygons upon which NASA’s Phoenix lander touched down on in 2008 and dug into. Perhaps they were formed by similar mechanisms or difference ones, contraction or convection, Moore told me during the briefing. New Horizons is already over 3 million miles beyond Pluto and heading to its next yet to be determined target in the Kuiper Belt. “With the flyby in the rearview mirror, a decade-long journey to Pluto is over –but, the science payoff is only beginning,” said Jim Green, director of Planetary Science at NASA Headquarters in Washington.